ABBOTT PARK, Ill., Feb. 1, 2017 /PRNewswire/ -- Abbott (NYSE: ABT) today announced U.S. Food and Drug Administration (FDA) approval for magnetic resonance (MR)-conditional labeling for both the Assurity MRI™ pacemaker and the Tendril™ MRI pacing lead. Patients implanted with these low-voltage devices will have the ability to undergo full body magnetic resonance imaging (MRI) scans, if required. 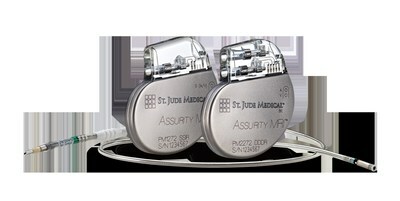 With the approval, the Assurity MRI pacemaker is now the world's smallest, longest-lasting wireless MRI-compatible pacemaker. The Assurity MRI pacemaker also offers wireless remote monitoring, providing physicians secure access to their patients' diagnostic data and daily device measurements and reducing the need for in-office visits. Remote monitoring of cardiac patients has become a best practice over the past decade, and studies have continued to prove its positive impact on patient outcomes and the reduction of health care costs. In 2015, the Heart Rhythm Society made wireless remote monitoring the standard of care in its guidelines. Pacemakers that allow patients to undergo MRI scans, such as the Assurity MRI pacemaker, have become an important advancement for patients who may need an MRI in the future but who do not want to risk damage to their implant. During an MRI scan, the Assurity MRI pacemaker works with Abbott's MRI Activator™ handheld device to trigger pre-programmed MRI settings appropriately tailored to individual patients. This unique technology can help eliminate the effort, time and patient inconvenience commonly associated with conventional pre- and post-scan pacemaker reprogramming. "A long-lasting and small wireless pacemaker that allows patients to undergo MRI scans is an important step forward in growing our available treatment options for patients," said David Sandler, M.D., director of electrophysiology at the Oklahoma Heart Institute in Tulsa, Okla. "The ability to choose a device to best address a patient's cardiac condition no longer has a tradeoff with MRI compatibility. It's the best of both worlds." Abbott has continued to build its portfolio of MRI-labeled products, and continues to work with regulatory agencies around the world to secure approval for MR-conditional labeling for many of its most commonly implanted pacemakers, implantable cardioverter defibrillators (ICDs) and cardiac resynchronization therapy (CRT) devices. "Our proven Tendril MRI pacing lead — which has been implanted in more than 200,000 patients worldwide — along with the latest approved MR-conditional labeling for our Assurity MRI pacemaker, will help provide patients access to diagnostic procedures while delivering the product performance physicians need to provide the best possible care to their patients," said Avi Fischer, M.D., medical director for Abbott's Cardiac Rhythm Management business. A pacemaker is a small, low-voltage implantable device that sends electrical pulses to the heart if the heart is beating too slowly. More than 4 million people worldwide have an implanted pacemaker or other cardiac rhythm management device, and an additional 700,000 patients receive the devices each year. A pacemaker monitors the heart's rate (how fast or slow it beats) and rhythm (the pattern in which it beats), and it provides electrical stimulation when the heart beats too slowly. Pacemakers can reduce symptoms of dizziness and fatigue when brought on by a slow heart rhythm, helping patients enjoy a better quality of life. A lead is a thin insulated wire that is placed through the veins and into the heart as part of a pacemaker implantation procedure. The tip of the lead is attached to the heart tissue, and the other end connects to the pacemaker. The lead carries electrical impulses from the pacemaker to the heart and transmits information from the heart back to the implanted device. Some pacemakers are referred to as "MR-conditional" or "MRI ready." This means that they are designed to allow you to safely undergo an MRI scan under certain conditions. By having a pacemaker implanted that allows MRI scans, you will have access to what many physicians consider their preferred diagnostic tool. MRI scans are considered the imaging modality that offers the most information to medical professionals when making a patient diagnosis because of the very detailed images it provides, combined with the low risk of radiation. Abbott collaborates with world-renowned electrophysiologists, clinicians and hospital administrators to develop safe and cost-effective treatment solutions for patients in need of advanced CRM devices. For more information about Abbott's focus on cardiac rhythm management, visit www.sjm.com/en/patients/arrhythmias.